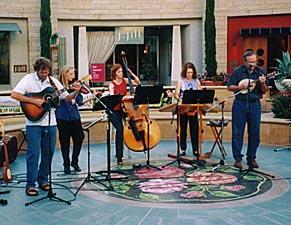 We feature various combinations of violin, viola, cello, classical guitar, Celtic harp, and other acoustic instruments. We are happy to work with your special requests, including arrangements, themes, and guest musicians. The Moreton Bay String Band features Violin, Cello, String Bass, Mandolin, Guitar, Banjo, Hammered Dulcimer, Recorders, and Vocals.